Dystopia is my idea of giving zombies more long jeopardy. I have made it in such a way that you technically have three maps in one, that all link together through a way of transportation. This is not like Tranzit, the maps are quite large. The idea of the map came to me from a quote Jimmy Zielinski made, I then had the idea of a new version of zombies which was almost like an expansive level to play on that worked like many games where you save and leave. I also wanted to keep the old zombies available so the main map still offers fun survival along with the option of these new features. The separate maps are named chapters, this still means the same thing as a map but makes it easier to talk about them as I refer to the overall idea as a map. Also, if I have made mistakes on this document such as forgetting to add something or just having something contradicting, please tell me. I have thoroughly checked through this to make sure this doesn’t happen but as you can see it is very long and has been worked on over a large amount of time. In the loading screen, players will be introduced to the blueprint that is found after the Buried loading screen. The blueprint is of this vessel, like a ship and will be expanded on later in the map. It is complete and not teared anywhere, but on the blueprint is a train ticket. This ticket is red with a white stripe going across it horizontally, on it is a location: Tokyo, a date: 1887 and a time: 9:35. Each area is labeled as a map in itself. But they are also named Chapters for ease.The first map is where you will spawn in. When a map is left, all perks, equipment, utilities and the mystery box will move over to the next map, but due to the time it takes to travel to the next map it seems as if they had always been there, when in fact only one set of each exist on a map. Gloomfield is a map based on an outpost run by 935, somewhere in the outskirts of France, as you venture deeper into you learn more and more information on their past. While Redemption is set around creating something to continue your adventure, it also is a whole new map based on other feels of maps like Stonehaven from Call of Duty Ghosts, Fracture from Titanfall and also some new ideas pumped into it. Finally Safe Haven? Is where things change for this map. As you reach your final goal, it may not be what it seems. This is where you can further develop the map and also choose how you really want to play zombies. You do not have to play in a new way, the old zombies style is still there and just surviving to a high round in the first chapter is simply good enough, if you don’t want to follow a quest. But if you do, there are multiple quests to follow in the first chapter, similar to the Ascension style. In the next chapter, it is more like Mob of the Dead’s quest for building transportation. The final chapter, is an even more extensive way to play. Since the maps are all separate locations, the chapter function makes it so that you essentially have a story being told in these three important locations, in the future if I use the chapter function, the areas will be simply one big map segregated into three. Locations for specific weapons will not be said aside from the Model 1887 due to it appearing in strange places. The order of wall weapons is seemingly the order you would find them in map. In this mode, if you have been playing for a certain amount of hours, time will change to night time. This will not be in real time but will however happen over the space of 3 hours between each shift. Their may be secrets that can be seen with the use of the light and the dark. Also the weather can change from raining, to clear and to a thunderstorm but these are only for visual purposes. Story: Over the past four years, the world has been left in the wake of the undead. After searching for answers, the group finally find a lead. A secret project, involved with group 935. After the loading screen, players will spawn in a that is completely desolate. A fence surrounds this area meaning you cannot escape. You begin at the entrance of the farm. Rain will have begun at this point no matter what it will always rain on round one. Somewhere in the area is a broken down tree which has a boulder next to it. By travelling up the field area you will come to an abandoned, small house. It cannot be accessed yet (if you have the key from later you can enter and find a turned over house, the upstairs is accessible leading to you being able to look out of a large circular window. At the top is also the Ammo-O-Matic Machine.) but at the back of the house is the Quick Revive perk Machine and storm shutters leading to a basement. Going down these storm shutters costs 750 points and brings you to a furnace which can be turned on and will power the perk and anything in the house but will not power anything else in the map. In here is also the rune for the zombie shield. After being here you will find a dirt path trail leading down into somewhere, following it will lead you past a broken down windmill with nothing of value near it for now and a sign that says ‘Welcome to Gloomfield” which is faded and old. Walking into the town leads you to the entrance of an abandoned town. First you can either walk down an alleyway, go up the main street or follow a path that leads to the side of Gloomfield. Going down the alleyway brings players to a wall that is broken down, leading into a coffee shop which holds the new perk, Miscshake and a possible box spawn. You can then buy the back door of the coffee shop that leads out into where the main street is. The main street leads upwards and goes past many broken down, old buildings. Beneath you is a stone brick road which can be walked up leading you upwards and then downwards, next to you are lamp posts seemingly from the Victorian ages. They will randomly flicker on and off. The whole of Gloomfield has Victorian architecture mixed in with modern things like neon signs and the like. Near the end of the street you will find Speed Cola and an entrance to the sewers. The Sewers are very confusing to traverse as the sewers look the same and can’t be distinguished. In the sewers is a box spawn and a crafting table, also is the barbed wire for the zombie shield. At random times, an event known as “the flush” will occur where the water in the sewers will begin to rise and push players to the exit out to the sea, but there are metal bars their meaning if you do not get out in time you will be crushed against it along with zombies who will kill you. Returning back on the street, it will eventually lead to an area which can also be accessed by the path near the start of Gloomfield. Venturing up the pathway leads you to a twisty road. To one side is just a field that is in front of an inaccessible building that is some form of manor. The other side of the path is blocked by a stone wall that has trees hanging over it, their leaves are orange and red like in autumn. Going up the path still, players will come across the statue of a knight holding a staff in his left hand. This staff is not like any of the staffs seen in Origins as it has no crystal and would be cradled by a ring that is attached to two other rings which get progressively smaller. The statue looks familiar, it has a beard and is bald, it stands tall on a pedestal refracting the light of the sun when it is up. On top of the staff is an hourglass which can be taken and will be put into the gold inventory section. Past this, players will find a gate in the wall. They can simply access this by buying it and be revealed to a garden. Inside, the garden is completely shut off from the rest of Gloomfield. It has plant life and vegetation all around it, even covering the Double Tap machine and a teddy bear. To leave the garden, you must throw grenades at a wall in the top left corner of the garden which will cause it to crumble and let you climb over into the next area, this causes the wall for the zombie shield to be available to put in the Grey section of the inventory. But this means that the undead can get through around the map much quicker once it is opened. If you had the key that can be obtained later, you can go into that manor. Only the first floor is accessible but it is interesting due to the chandelier falling when shot and giving players 25 points. Also a random drop can be found in here that will only disappear once picked up, it will also change every five rounds. Now, if you have progresses through any or all of these routes you will be brought to a more complex area. You will be at a road that surrounds a structure which itself is surrounded by high walls that only get cut off from their circular shape at the back of the structure. There is no visible way of getting into this area yet but you can walk around the stone brick road and look around. The same lamp posts appear around this area too. Next to a house you will find a bench which has a beacon on it. To open the walls, players must do a task which has them activating four unlit lamp posts. Upon doing this the front wall can be brought and they will fall into the floor. The floor will open to reveal a set of stairs. Descending down them, players will see cobwebs and dust covering the stairs. The stairway twists downwards but, around it are railing making it so you cannot fall off but the area around this is complete darkness. Reaching the end of the stairs will bring you to, yet again, a pitch black area. By walking around this area you will be able to tell that it is small and compact, with a door at the back that is closed. Power must be on for the door to open. If you go through the door, you will yet again be in the dark, but this time you are in a narrow hallway, or so you think. At the end of the hallway, there is a large set of stairs leading upwards. Upon getting to the top of these stairs you will find another lever like the normal power switch. Pulling it will make flood lights activate all around the room, machinery begins to activate pumping 115 into a machine behind where the switch is. This area is not yet accessible but it is evident that where you are standing surrounds the machine, but it is on a lower level. You will find that you were never in a narrow hallway, but a huge laboratory. Looking around, you can find chemicals, technology and other experiments that had been going on. There are even tables with Wunder Weapons being taken apart. Near the back left of the room are two pylons, they surround a complex machine that surrounds the head of a giant from Origins. On the right is a more closed off section of the lab, it has many experiments in glass casings that are lit up around the area. In one are the Pentagon Thief's device he wears, in another is Peter McCains hand. There are lots of random zombies memorabilia around this area. By activating three red switches at the left, right and back of this area, a wall will open, revealing to players a rolled up blueprint. Taking this will allow players the option of going to Redemption. To get to this chapter, all players must head back to the clocktower. While here, the player with the Deus Ex Machina must shoot at the clock multiple times, while all other players shoot the top of the clock tower with any weapons. (If you want to go to the next chapter again in the same way, just shoot the clock 5 times with any gun and your player will be brought there.) Once this is done time will begin to bend. Everything will turn black and white for a moment. Then the players will fall through time to Redemption. 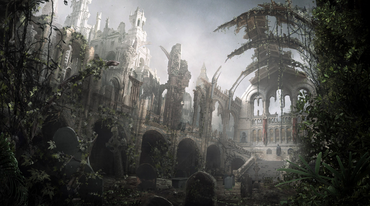 Story: Built on the grounds of a ruined castle once occupied by the Templars, humanity's last hope would be forged here and lead to the survival of man. Sadly the project was never finished, but with the blueprints left from Maxis and Richtofen, you may ascend from darkness yet. Redemption shares the cold early morning feel that Gloomfield had but seems much more fog covered, not like Tranzit but an easy enough to see through fog. Arriving on this map will bring you to the grounds of a structure like a castle but much larger and very ruined. But you have been dropped off in front of the structure. The Quick Revive perk machine can be found straight away, near a closed off cottage. The structure has very high stone brick walls, when going over to it you will only be able to walk around the building, except for the back of it. The area that you can walk around also has a number of rucks and broken down structures. It is reminiscent of Stonehaven from Call of Duty Ghosts as it looks like the map in some ways except for the building being at the back not the right and the fact that the outside is the same size as Stonehaven. You can walk around the open area but you will not find anything of value to you yet aside from the mystery box if it has spawned there. To access the building you need to repair a winch at the door. There is a cog that can be found and crafted onto the winch, then you can pull the lever for 1500 Points. When you enter the building, darkness will surround you. The undead will climb from different closed off rooms. You can either go left, right or up. Going left brings you to a narrow hallway that has Double Tap in it. This hallway has significantly more blood in it than the right hallway which has Speed Cola in it and a crafting table. By going up a set of stairs you will be brought to a scaffolding area. All of the scaffolding surrounds a large beacon, it is deactivated though. The scaffolding leads to a wall, you can put the blueprint on it. Once you have done this it will be surrounded by images of parts. Your task is to gather them. Doing this means you have to venture out of the building and go behind it. If I haven’t made it clear though, these areas are very large. This area of the map alone is as big as No Mans Land in Origins. For 2000 Points you can access the building. This area is a lot more brutal than the last few areas. At first there will be a shallow river. There is a bridge that you can walk over to get across the river or you can just walk under it, especially since under it is Deadshot Daiquiri and an engine. The engine will be put in your inventory under the purple section when you obtain it. After the river is a hill, going up this can be tough mid round as zombies spawn everywhere in full force attacking you. But if you are clever enough to make a crawler, its easier, as long as you don't let it get killed by the things on the hill. From the ground, spikes will push up from the hill. When you get through the harsh battle, you will be at a building. You can open it straight away for 1500 Points and once the building is entered you will have a lot more breathing room. Prone diving down the hill will mean you go down due to you falling all the way down, unless you have PHD Flopper, that makes the game much more funner. If you are wondering whether it is just a small hill, it is not. It leads to a large area that is walled off and cannot be seen over. Upon entering the door for 1000 Points you will see just how big this area is. The land is very cracked and ruined in this area, it is not level like the ground below the hill. There are three buildings, one that is broken down, destroyed and medium sized and a smaller, more recognisable building. Also there are ridges that are attached to the area and lead to other areas that can be accessed by a Gondola esc carrier. There are zip lines like from Call of the Dead all around this area leading from one building to the ground or to another building. The first building, being ruined and destroyed, is very open. You can walk through it but the upper levels are not accessible. A box location is here and a crafting bench. Further away from this building is a pylon, the pylon is the only one in the area and actually has wires hanging off of it which can be obtained as parts that will go into the purple inventory. Stamin Up and the Model 1887 can be found on a wooden board, you must jump upwards to buy it. Stamin Up is a must have perk where traversing the hill as you can just fly up and down it faster than before. Finally is the smaller building which is on its own compared to the other building. In the distance are walls standing alone in front of the building. As you get to the building you will find a broken down door. Walking through it you find yourself in a bunker. It is a bunker that is almost identical to Nacht der Untoten’s bunker, except for the fact that it is… newer. It looks as if it was not built long before the apocalypse itself, there are no broken debris found anywhere. Only boxes marked element 115. While here you can find the mystery box if it has spawned here and various weapons on the walls. The entrance you came in can be boarded up like a window, in doings this sandbags will also be built up, making it essentially the original Nacht. With the benefit of being able to escape by just throwing a grenade at the sandbags to move them. Though a version of Nacht appeared in Tranzit, this version is here specifically to make the transition between the old zombies format and new format easier to bare with since a lot has changed between them. Also this is where you can end your zombies journey if you wish to retain the classic zombies as much as possible. Or you can continue to the augmentation of zombies. On the side of the bunker you will find a Fuel Cell. It is a circular machine that is empty in the middle. It also has a meter made up of many lights that is not filled. Also sitting next to the outer walls is Mule Kick. Near the left edge of this area is the most important part of this chapter. There is an unfinished vessel, chained to the ground. It is surrounded by large runes that are connected by barbed wire, like an extra large version of Stonehenge that breaks off near the edge of the map, which you can fall off of and into nothingness. Standing next to the archway is PHD Flopper and the Weapons Locker. Near the vehicle is a key that is on a table. This is the second to last part. Once you have this you can return to the beacon from the previous building and use it to activate the beacon. A white light will shine from it and you will be given a small ball that pulses with electricity like the meteor in Shi No Numa. It makes the characters wonder if it is linked to the meteors that fell from the sky and were taken by 935. The Key is very handy for opening up new features and areas in the other chapters too. In the archway is also a box location, Juggernog and the power switch. This is the first time through all of the progression of this chapter that you will have had power. Pack-a-Punch cannot be accessed in Redemption, only the other two chapters. With the parts crafted and all tasks done you can now leave, prepare to venture to Safe Haven. Once you have all of the parts and have crafted them to the vessel it will be ready to leave. Are you ready to leave though? Where you are going is new territory to zombies. The journey will be tough but it will all be worthwhile. All aboard the X-Dark Vessel. Planned in 1915 to bring humanity away from a world that was about to rip itself apart. Created from the blueprints of Ludvig Maxis and Edward Richtofen. 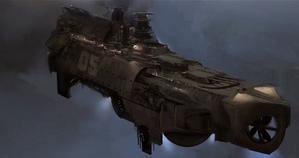 It is hard to describe due to its Dieselpunk looks but I will find an image of a vehicle that is slightly like it. If you wish to call the vessel from another chapter, simply find where it would land and call it, similar to the tank. Imagine a merger of both of these, a dark metal hull with wings, smoke coming out of the pipes and the fan type things at the front. Also the platform at the top which you stand on is only the back area of the ship, not the front. As you stand on top of the vehicle, steam will begin to blow out of pipes that sit on top of it. Liquid 115 is pumped through pipes that are attached to it. A loud hum begins and the vehicle begins to ascend. The chains break and fall off of the vehicle. It floats to the air and begins to travel slowly forward towards safety. But it is not an easy journey. You must fight your way through the undead, with your supply to Perks and Pack-a-Punch deactivated. Meaning you have only normal guns and have the health of an only just spawned player. But not all is lost, you can make a crawler and trap him in a glass container, meaning that you can shoot him but he cannot escape or attack you. This costs 750 Points. There are various blockades of machinery around the area, but it is as large as three of Burieds Processing areas, if it were a whole square and not platforms. The back of this vehicle, is at an angle and leads to an extra platform with a large box. The box is wooden. On it are three colours: Red, Yellow and Blue. Pressing Red brings you back to Sanctuary, pressing Yellow brings you to the Redemption map and the Blue brings you to the safe haven. Where will you go first? Perhaps you want to go back to the beginning and fancy returning to where you started the adventure. Or maybe you prefer the challenge of a docking bay for this vessel. Only go to safe haven when you are ready. You will need to prepare yourself. Story: This technologically advanced utopia was created to evade the infection on the Earth below, but when some members of 935 began experimenting on people to make them survive against infection, things went wrong. In a last ditch attempt humans were bonded with an exoskeleton and endo skeleton to keep them alive, but they lost their humanity. Now all that is left is a machine that needs to be repaired, one which can lead to the real safe haven. Upon stopping at Safe Haven, players will each need to leave the vehicle. Once they have gotten off, they will be standing on a raised bay, the vessel will float, chained next to this bay until you feel the need to return to the other maps. Looking in front of you, there will be a sight never before seen in a zombies map. A utopia like city, with many large, towering buildings stands tall above you. The city itself surrounds another city that is somehow floating above something that cannot be seen. The other city is smaller than the surrounds but is all the more awe inspiring. It is connected to the ground by intricate, large chains that pierce the ground beneath it. For an idea of what it truly looks like I have left an image that is close to its look. This place is not safe though, the undead will begin to spawn. Due to the time it will take to get to this area, possibly round 20 or there abouts if you are lucky, the undead will begin to spawn and any crawler you may have owned will have died. Now your perks are back online and Pack-a-Punched weapons returned, prepare for a challenge. You must fight the undead, while progressing through this map and finding all of its secrets. Also there are objectives that make the play style even more different but these are only optional. As soon as you have left the vessel you will be standing in a crescent shaped bay. It is open at the top letting the sky be seen. When walking to the back of the bay you will find a wall with Quick Revive against it and a glass tube part that, when obtained, will be placed in the green section of the inventory. To escape this are you must go to either the left or right which will bring players to a set of stairs. These stairs lead to a platform that surrounds the above area of the crescent room but, much like the spawn in Ascension, leaves the centre of the area open. The platform can easily be jumped off and back down into the spawn. On the platform are two doors that lead out of the spawn. This brings players to two bridges that go diagonally outwards. These bridges have curved metal arches, starting to curve from the roof of the doorway and reaching to the end of the bridges. At night these bridges are lit up with flood lights. Beneath the two is a dark abyss. It like a gas that is entirely black, making it impossible to see into. Both bridges reach down very long. Fighting through them is hard due to the zombies constantly spawning in front of you and possibly behind you if you are too slow. On the left bridge is the Speed Cola machine and a weapon that is useful for surviving. On the right bridge is the Double Tap machine and a pile of powdered element 115. Reaching the end of both bridges leads to a door that brings players to the below city. The below city is made up of many inaccessible buildings, you must traverse around the streets. I will not go into detail on where everything in the streets are but the shape of the streets is a simple triquetra shape. You can walk around the streets and find the perks: Deadshot Daiquiri (with a crafting bench), Mule Kick (with a box location) and PHD Flopper (with a Vile of Verdana placed next to it which will be placed in the green inventory) at each respective corner of the streets. Opposite the perks are the chains that are connected to the city. The buildings are made up of wood and look like small cabins that are not ideal to live in but for the people of this Safe Haven, they were home. Under the floating city is above a dark abyss that has what seems to be what is seen when travelling through a portal. This seemingly pushes the city up as you can occasionally see it bob up and down. Due to the complexity of the area, I have added an image of how the layout works. Upon getting to the streets, you need to know that your objective is to get up to the floating city, even if the below is filled with the undead there is always hope that the above is safer. There are three chains spanning off of each corner opposite the perks. Next to each is retina scanner. By getting zombie blood near the left chain, you will activate it. By using Zero’s Eyeglass you can activate the right chain. To get the back chain to be activated, you must attack it with a zombie shield until it breaks. Once these requirements have been met, the upper city will begin to float up higher. A wall will open in the bottom of the streets (bottom middle of the triquetra) and you will be able to enter the portal. Jumping in the portal will cause you to at first fall and then be propelled up into a hole at the bottom of the upper city. Zombies will begin to jump up over the edges of the city so be prepared. You can jump off of a few edges to get back down to the lower city but you will be damaged unless you have PHD Flopper. Once you have been shot up into the city, the area you came through will not let you fall back down due to some sort of magnetism keeping you upwards. The area you are in is a a very open and empty courtyard. Surrounding you are six skyscrapers that reach very high up. They curve inwards and create a point above you. All around you are metal beams and frames, much like as pictured below. They are easy to traverse through due to the space you are provided with, though the size and shape of this whole area is very ominous and begins to tell you that there was more to do with this city. Maybe it was a false safe haven where far worse things happened than on the ground below. There is a catch to this area. It is split up into eight segments. Four segments on the bottom and four above. These segments will randomly twist every round, making areas move. This can be a problem as if they move in such a way that the area to stand on is moved upwards, you will be stuck there and will not be able to ensure safety when jumping back down to other segments. This makes this area hard to traverse and makes running circles with zombies impossible. Segment 1 will bring you down a pathway which gets thinner and begins to turn into a twisted set of alleyways. These alleyways sometimes have dead ends, two of which lead to a box location and the Electric Cherry machine. If you have successfully made it out of this area, you will find yourself at a skyscraper entrance. Entering this skyscraper will let them traverse three floors. The stairwell that leads up the floor is blocked pas this (though if you have no clip somehow, you may find some Easter Eggs in the above floors…) Nothing is on the bottom floor, however the second holds a box location and another crafting table. The third floor is home to the Miscshake machine. This is the only accessible skyscraper as the rest are outside of the playable area. Segment 2 will lead players to an area with ticket booths. These surround a skyscraper but this is not accessible. Here you will find the generator. You can craft the parts of the green inventory here and then you must just pull a switch. Also there is a lot of debris around, giving the ability of good spots to survive. Segment 3 is surrounded by metal fences, these surround a graveyard which have graves that are not accessible to walk over. This leads to a large cathedral. Outside of the cathedral is Tombstone Soda. Upon entering the cathedral, you will be able to run around the seats and all the way up to the altar. You will be able to find a box location at the back of here. By going up a set of stairs, players will be brought to the next level which looks like a normal attic. Lots of crates can be found here and at the back is the Amm-O-Matic machine. The final accessible segment of the map will bring players to an area where the beams have fallen and traversing is very difficult. Somewhere in this mayhem, you will be able to find the Juggernog machine which is slightly raised as to make it noticeable and an exit where the area normalizes again. This will bring you to a rounded dome building, that is almost like a bunker. At the front of it is the Stamin Up machine. The bunker contains some links to 935, such as a large map that marks on all past map locations and a new one which is the next map. In here you will find a cave entrance, this should not exist though as you are floating in the sky, there are no caves to go to. For 2500 Points you will be allowed to descend down the caves. Areas after the caves are not affected by the segment change. After venturing down them for a while, you will find a chamber room carved into stone. The area you are in has five statues at the back. In their hands are swords much like in Origins’ main chamber except this area is untouched by anyone. These statues are of the ancients but with a statue that looks like Maxis in the middle of them. At his feet is the Pack-a-Punch machine, it looks a bit dustier than usual but is still normal. By throwing grenades at a wall with a black sun symbol on it, you will open up to another cave. This cave leads upwards and eventually brings you out next to a tree. This tree is the same one that can be found in the spawn of Gloomfield. You have gone around the whole map and came back out of the boulder which you first spawned near. The link between the caves can only be explained by the same reason that Buried is underground. All of the chapters can be played separately, each being their own survival map where you play as different characters for each. These maps do not follow the same save functions as Dystopia. In Gloomfield Survival you play as the four marines, from Nacht der Untoten. Except one of them, Dempsey, is replaced by somebody who wears a duster jacket and has brown hair, his name is Peter McCain. They do not talk and cannot access any of the Easter Eggs, in fact they spawn next to the house not in the crevice, no undead are in the ravine either. Redemption Survival is a lot different than before. Its is less ruined and in fact looks as if it is still being built. You play as four Templar Knights, each identical. When using weapons they will be confused as to where they came from, but aside from that will not talk. In this mode the undead have the blue eyes, like in Origins and the X- Dark Vessel and any remnants of technology cannot be found, even perks. It is much like Bus Depot in format. Also Nacht der Untoten does not exist and is replaced by a bunch of rubble. Voyage cannot be played but Nacht der Untoten can be played in its former glory as the same characters from Gloomfield. It is the same as the classic map but more polished and new. Finally, in Safe Haven? you play as a group of four people, these people share the same model. They have brown hair that is shaven down quite a lot and their eyes are two colours. Blue and Green. Though they wear a white shirt, each has a different number on a badge. These numbers are: 9-23-20, 1-16-17, 23-16-8, 8-20-18-7-20-9-8. They are etched into very small gold badges, but do they mean anything? These characters also wear black trousers. Also, they have a metal skeleton frame around their body, like an exoskeleton but more like piping and less complex. The map is mostly the same but the power is already active. Due to the size of the maps, it takes longer for them to load. Not by too much but only a minute or two more. While loading in the cutscene that you would see in solo will begin playing. You can either watch it or skip it by pressing a button. Upon skipping the comic book will just be shown with a bar to show the loading progress. Now, Public matches and Custom matches are changed a lot. Custom matches, where you load in with four friends, count towards the leaderboards. This is essentially the best way to play when you are aiming to do all of the new things in it and will come into play later. Public matches, still count towards leaderboards, but now there is a way to “find new lobby” by just selecting that option. Sometimes, the map will be hard to play with public match players if they refuse to help. That is a problem that cannot be rectified as you have to do quests to progress meaning that if they can't cooperate then, you are out of luck. But if they do and can talk to you, it may be much more enjoyable. The key feature that makes playing this possible for regular players is the save function. It works in a number of ways. The host in a public match or custom match can go into the pause menu and press: Save and resume later. Upon pressing this they will be given a prompt to say that they are choosing this. Once they do this, the game will pause for all players and they will be given a screen that says: Do you want to save and resume later? If you say yes then it will say are you sure. If you say yes again all players will be put in the lobby, but there game will be saved. Much like saving a campaign level, it saves your stats, weapons and so on. If you are wondering whether it can be a way to ruin games when people don’t want to play and want to annoy people, it can’t really happen. If the save or resume is rejected, the host will not be able to initiate it for another ten minutes. I know there could be arguments in public match if you don't find people who want to play how you do, but that is why you can find a new lobby. This function needs to be in the game to make the expansion possible to keep playing in different sittings, rather than in one go. Longer games like these may mean higher rounds where things still can get boring, but there are challenges in the map that can only be unlocked after round 25 making players still have a reason to play. These save mechanics only work with the main map not the segregated survival maps. Alexus Valentine: Alexus is the only woman in the group, this does not mean she is looked down on any less though. Her skills for handling weaponry and slaughtering the undead can barely be matched. Unlike female characters before, Alexus is a strong, collected individual who doesn't shy away from the undead but at the same time, doesn’t act tough against them. Alexus’ hair is brown, it is not too long and only reaches her shoulders, on her fringe she has a red streak of hair. Alexus was born in Britain, her eyes are brown and she is in her early 20s. She wears a black leather jacket that seems slightly too small for her. Under she has a white shirt with a pink stripe going across it diagonally. Her trousers are black, she also has clean white trainers. Her favourite weapons are Shotguns and the Deus Ex Machina. ‘Magnus’: Calm, brave and courageous, Magnus is the leader of the group. Being a part of a mercenary force, Magnus has a lot of prior training with weaponry. Upon meeting the group, they knew that they could not survive without establishing a team leader, Magnus was perfect for the role. His real name is unknown to anyone but himself. He comes from Boston and is in his late 20s. Magnus’ hair is black and pushed to the side. His eyes are green. He wears an armoured uniform that covers his chest. It is mostly green and grey. Underneath he wears a green turtle neck jumper. His favourite weapons are SMG's and Pistols. Dexter ‘Dex’ Plugg: Dexter is the most intelligent person left on the planet, his inventions have been the key to the groups survival. Holding himself up high, Dexter knows his importance to the group. Born in Britain, Dexter often took his toys apart and built them into large machinery. His enhanced knowledge of engineering meant that his mind was highly sought after. Nowadays he is more unstable than he was, while his sanity is slowly fading away he is still a brilliant inventor. Unlike the others, he seemingly has ties to at least some branch of Group 935 but was no where near high up enough to know of some of the stuff we have seen in past maps. Dexter wears a set of large, golden goggles over his eyes that have even more lenses surrounding them, much like the Pentagon Thief’s. He wears large welding gloves. On his body he wears a brown waistcoat over a white shirt with his sleeves rolled up. On his back he has a large backpack filled with cogs, gears and machinery. Being the smallest of the group, this weighs him down to be equally fast as the rest of them. His hair is brown and is very messy, sticking up in a lot of places due to him not caring about it. Dexter is around late 20s to early 30s. His favourite weapons are Sniper Rifles and any Wunder Weapon. Sergei Petrov: If you have ever wondered what the definition of awesome is look no further. Sergei is a tough, cold, heartless killer with a bloodlust that is unquenchable. None of the undead can escape his grasp, if they try to bite him he will end their non existent lives. Sergei is Russian. Growing up in Moscow, Sergei trained in the military and eventually fought a war. Upon leaving the war, he began working as a weapons expert, meaning he has a grasp on many of the weapons you will see in map. He is around 50-60 years old. He has a grey beard that covers his whole mouth. He is never seen without a cigar in his mouth. On his head he wears a black wool hat on his head that covers any hair he has. His favourite weapons are heavy weapons like LMGs and Rocket launchers. Zombies: In Gloomfield the zombies models are either scientists or soldiers. They have yellow eyes. But in Redemption they are Templars that look more skeletal than in Origins, they also have yellow eyes. Voyage has zombies from Gloomfield. Safe Haven? has zombies that are dressed in various attires, some like soldiers in black uniforms and others in regular civilian attire. They’re eyes flow with yellow light like some of the zombies in Exo-Zombies. There are rounds in which the undead become even more relentless and begin to sprint as fast as zombies in Verruckt. They will begin to light up in golden flames matching their eyes. The Watchers: These beings are ghost like entities that will stand outside of the map staring at a player. If they looked upon, shot or even witness a zombie being killed, you will be chased down by them. The Watchers are tall, thin, dark figures that have large, round, blue, glowing eyes. They can only be found in Gloomfield. Killing them awards players a perk drop. Savages: The Savages are Ogre like beings who can only exist in the Redemption chapter. The Savages have a sickly green coloured skin, they are very large and imposing, being as big as a Giant from Origins foot. On their head is a metal cage that covers their head, horns stick out of the sides and twist upwards. The hands of the Savages are big and when it by one you will be hit across the map and downed. To take them down the player must shoot at their legs, as they are smaller and are the weaker points. But be warned, if you are not in range of the Savages arms it may open the cage on its head and reveal something so horrific that you will be instantly downed if you are facing the direction of it. To tell if you are staring at its face, you will see a white light coming from the cage rather than the face for ease. Savages cannot venture into buildings and will not be able to get up the hill. Upon killing a Savage you will be given a perk bottle and a random drop. 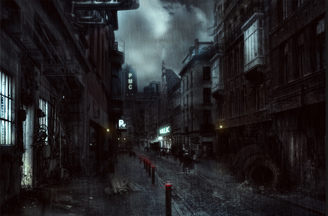 The Abomination: In the Safe Haven, in the deepest, darkest sections of the city, you may come across a beast so horrifying that you will wish you had never came here in the first place. Before you can react, the abomination will jump out of the shadows and try and tear you apart. The abomination is very fast, having Stamin Up means you can outrun him, if not… Thats it for you. The Abomination seems to be a human who has been fused with a metal exoskeleton, not like one from Advanced Warfare but an actual body cover that also, fuses with the flesh. His Wires are falling out of him and his cover is broken in many places. His eyes glow red from large round eyes, on his face is a big grin almost like a crescent shape. The mouth flashes white when he speaks. The Abominations limbs are long and thin. At the end of his arms are sharp claws that cut like a knife. To kill the Abomination, you must shoot at the uncovered human parts of his body. He takes a while to kill but once he is dead, he will not plague you for five rounds until he has repaired himself. A perk bottle will be dropped as a reward for killing him. Miscshake (2000 Points): Miscshake is a perk drink that essentially combines many of the perks that cannot have their own perk due to it being useless, it is akin to an improved Exo Soldier. This perk allows players to switch weapons faster, keep weapons held up while sprinting, keep guns out and shoot them while prone diving, improves hip fire accuracy and reduce weapon recoil or sway. Though this seems like a lot for a perk, they are not giant game changers while separate but together make a reasonable perk. The symbol is white and has grey outline of a hand holding a revolver upwards. Power: There are different ways to turn on the power in each chapter. In Gloomfield, you must use the furnace to power Quick Revive, then connect the wires together to power perks in other areas. This is difficult as the wires can get confused and fuse each other out if not connected right. Next, in Redemption to activate the power you must just simply reach the top of the hill and pull the power switch lever that has been seen in many classic zombie maps before. Finally, in Safe Haven? The players must obtain a glass tube, powdered element 115 and a vile of Verdana. These will be placed in the green inventory until crafted onto the generator. Zombie Shield: Crafted out of the rune, wall and barbedwire. Schematic will be obtained when crafted to be taken to other chapters. In Dystopia, their is a newer and more efficient version of the inventory and the crafting system. There are four sections in the select screen, much like the MotD and Origins inventory. The four sections are labeled as colours: Gold, Grey, Purple, Green and Red. The Gold section is where the parts for the Deus Ex Machina will go, the Grey is where the Zombie shield parts will be stored, the Purple is where the X-Dark Vessel parts are stored, under Green will be where the power system parts go for the final chapter. Finally, the Red section is where the parts too the Nightmare Mechanism. When an item has been used in the inventory it will have a cog symbol on top of it. The only item that won't have this symbol is the key, until the Nightmare Mechanism is activated. In each chapter there are different forms of challenges, similar to what was seen in MotD and Origins. Since challenges are optional in Dystopia and are by no means forced on the player, they aren’t automatically activated. There will be a stone tablet behind the chest which has a set of five symbols on. They will light up when the challenge is done and can be hovered over to choose the reward. There are three columns of these three symbols, each for the other chapters. All rewards can be obtained on any chapter. Tier I.) 1.) To activate the first tier of challenges on Gloomfield, you must simply do the first step of the Easter Egg. This will let players then go around the map and find 7 stone statues of skulls on a atom shaped ball of blue energy, which has stone ribs encasing it. Feeding 20 zombies to each will cause them to retract into the ground whilst making a breath sound. Once all have been filled, the statue in front of the garden will be have an old chest that when activated will award with an idol, ‘Strength’. Giving players a damage boost. 2.) The next challenge that can be done is gaining 115 head shots. This will award players with a free Pack-a-Punched weapon, this can be The Afterburner, Spatz-447+, Reznov's Revenge or the Predator. This can be found in the chest in front of the statue, the symbol must be hovered over to access. 3.) Spending 30000 Points. This will award players with a free Quick Revive bottle. Use this when most needed. This can be found in the chest in front of the statue, the symbol must be hovered over to access. 4.) By getting 115 melee kills, players will be rewarded with being able to obtain a dagger from the chest. This dagger is a one hit until round 25, also being the only one makes it very valuable. 5.) By obtaining 115 grenade kills (monkey bombs do count) you will be able to go to the chest and access an upgraded grenade which will act like a drone, following zombies and latching on to at least one to blow them up. This will create crawlers easily in later rounds. Tier II.) 1.) To activate the second tier of challenges on Redemption, you must simply do the first step of the Easter Egg. This will let players then go around the map and find 7 stone statues of skulls on a atom shaped ball of blue energy, which has stone ribs encasing it. Feeding 20 zombies to each will cause them to retract into the ground whilst making a breath sound. Once all have been filled, the chest will appear under the bridge and you will be able to claim your reward of the second idol, ’Hunger’. You will be able to summon flesh to throw and draw zombies, this requires players to press down on the D-Pad or any variation on that depending on your control set. 2.) The next challenge that can be done is gaining 935 head shots. This will award players with a free Pack-a-Punched weapon, this can be the Agarthan Reaper, Magna Collider, D00M or Powerhouse. This can be found in the chest, the symbol must be hovered over to access. 3.) Spending 60000 Points. This will award players with a free Double Tap bottle. Use this when most needed. This can be found in the chest in front of the statue, the symbol must be hovered over to access. 4.) By getting 935 melee kills, players will be rewarded with being able to obtain the ‘Eternal Blessing’ on the dagger from the chest. This dagger is a one hit until round 35. 5.) By obtaining 935 grenade kills (monkey bombs do count) you will be able to go to the chest and access extra slots for tacticals and lethals, while also giving them higher damage. Tier III.) 1.) To activate the final tier of challenges on Safe Haven?, you must simply do the first step of the Easter Egg. This will let players then go around the map and find 7 stone statues of skulls on a atom shaped ball of blue energy, which has stone ribs encasing it. Feeding 20 zombies to each will cause them to retract into the ground whilst making a breath sound. Once all have been filled, the chest will appear in the start of the intersection of roads and will let players gain access to the final idol ‘Lament’ which will trigger when players are red screened by giving them a temporary force field that kills the undead. This will also allow you to continue the Easter Egg of Safe Haven? 2.) The next challenge that can be done is gaining 935 head shots. This will award players with a free Pack-a-Punched weapon, this can be the Ray Gun, Ray Gun Mark II, CHB 180 or the Titus-6. This can be found in the chest, the symbol must be hovered over to access. 3.) Spending 90000 Points. This will award players with a free Juggernog bottle. Use this when most needed. This can be found in the chest, the symbol must be hovered over to access. 4.) By getting 1115 melee kills, players will be rewarded with being able to obtain the ‘Demonic Sin’ on the dagger from the chest. This dagger is a one hit until round 50. 5.) Obtaining 1115 grenade kills (monkey bombs do count) you will be able to go to the chest and access extra slots for tacticals and lethals, while also giving them higher damage. The weapons in this map are taken from many different Call of Duty’s with the edition of a couple of weapons that are new and are either based off of a game or not based off of a game. If they are based off of a game there will be two stars to signify it, if not there will be one star. Also weapons based off of a game will have the games name next to them. Weapons can be fused with a torch that will help in night time and in dark areas like the lab. This can be found in the spawn of Gloomfield. Deus Ex Machina: This weapon has many gold cogs and discs on it, the rest is made up of a golden and black rifle shape. When it is shot it will send out a white and gold beam which will turn any zombies in its path to dust. This weapon does this by manipulating the space around the zombie and dragging its essential life force out. It can be obtained by crafting the hourglass (found in the statues staff), stardust (obtained by collecting from a fallen shooting star that can appear upon Easter Egg start) and the beacon (found on a bench) at any crafting bench. It can be found in the box if it is lost. This weapon cannot be upgraded as it is too powerful. Ammo count: 7/77. Solar Amplifier: The Solar Amplifier is a weapon that absorbs light energy and then shoots it out in waves that will rip apart zombies. It is a one shot until round 25. To upgrade this weapon it must be put inside of the Pack-a-Punch machine with the Lunar Manipulator. Once combined it will become the Interstellar Nova Cannon CXV. Ammo count: 10/40. Lunar Manipulator: The Lunar Manipulator is a weapon that absorbs dark energy and moon light energy, it sends out beams of moonlight that will make zombies crumble. It is a one shot until round 25. To upgrade this weapon it must be put inside of the Pack-a-Punch machine with the Solar Amplifier. Once combined it will become the Interstellar Nova Cannon CXV. Ammo count: 10/40. Interstellar Nova Cannon CXV: This weapon is the combined version of the Lunar Manipulator and Solar Amplifier, both weapons being put into the machine will equal the cost of 10000 points (5000 for each weapon). The Interstellar Nova Cannon CXV shoots out a large ball of energy which is surrounded in light and dark rings. The gun will begin to spark and if used too much will stall for exactly 35 seconds. It will consume the undeads life force and leave them hollow. It is a one shot for almost all rounds except infinity mode. Ammo count: 20/80. Zeros Eyeglass: The Eyeglass belonged to an unknown character named Zero. He created the glass to have the ability to see through different dimensional spectrums. This ability allows for the user to have a sight much like Vulture-Aid Elixir while also giving all characters a visual change to wear the eye glass, aside from Dexter who will have the Eyeglass behind his left lens which will also be farther out than the right lens. The Eyeglass will be rewarded for turning on the clock tower and will be given to all players for free. Step 1.) Build the Deus Ex Machina. Step 2.) Complete all challenges in Tier 1. Step 3.) Align yourself in front of the statue and shoot through where there should be a crystal for a staff. You must do this at night with the Lunar Manipulator and at day with the Solar Amplifier. This will cause half of a crystal to appear for each. Upon doing this a green crystal will light up. Step 4.) You must continuously gather zombies to be trapped in the flush. Once this happens enough the crystal will send out a light in the sky and let the next step of the Easter Egg be done. Step 5.) Randomly around the map, there will be symbols that have a total of three separate spawn points as to where they can be (they will always be outside of the map), upon finding these, you must activate them in the right order. To know the order, you must use Zero’s Eyeglass to look at the roof of coffee shop. Step 6.) Next, players will find the four, once unlit, lamp posts flickering. By interacting with them they stop but this must be done in a correct order. This order is random and must be done through trial and error. This will open the back room of the clock tower. Step 7.) Finally, the players gain access to the laboratory and must obtain the blueprint. After doing this, you will be awarded with to buy perks back that you have already obtained through drinking (not drops) for half price. Step 1.) Lower the drawbridge. Step 2.) Complete all challenges in Tier 2. Step 3.) Kill five Savages under the bridge. This will make a red orb appear in the broken down building. Step 4.) You must continuously knife the orb with the Eternal Blessing Dagger until it reaches the front of the cottage. When here it will open the door. Going in the door will let players find a code. By looking at this, they can decipher norse symbols that have now appeared on some of the ruins of the castle. Step 5.) Shooting the correct ruins will cause them to sink in the ground. This will then cause the symbols to appear on pillars of the Stonehenge like area. Step 6.) You must simply feed zombies to these pillars until a teddy bear begins floating in the centre. Step 7.) Now, you must collect the parts for the X-Dark Vessel. Though you can do this at any time. Doing the Easter Egg here will make the teddy bear spawn. Bringing it onto the vessel will make it so that the undeads souls are gathered by it. For doing this quest, you will see an increase in drops and make the meat drop become a standard drop that can exist which will work separately to the one from the Hunger idol. Step 2.) Complete all challenges in Tier 3. Step 3.) Kill the Abomination while it is in the magnetism below the city. Step 4.) Survive in the segments. You cannot leave the upper city for 5 rounds or else you will have to repeat the step. This isn't impossible but may be difficult. Step 5.) Run from the start of one bridge to the other end and back in under 15 seconds. The lights will turn on and will keep turning on until all are lit, giving you the time limit. Then repeat this on the other bridge for another 15 seconds. With others, only one player is required for this step, though doing both bridges at the same time may be easier. Step 6.) At the chamber of the ancients, players must kill enough zombies to feed each statue. 15 are required for each. Step 7.) Light will pierce through the statues eyes. They begin to cycle through many colours until finally landing on white. This will then spawn a reward of free Deus Ex Machina and Interstellar Nova Cannon CXV spawning in front of players. If you already own these weapons, they cannot be picked up. Step 1.) Complete all chapters Easter Egg quests. Step 2.) Confess your sins at the altar of the cathedral, to signify you have done each step there will be an earthquake wherever in the map you are from now on. Step 3.) Kill 66 zombies at Nacht der Untoten using the Demonic Sin Dagger. Step 4.) Shoot four glowing tombstones and release the souls. Step 5.) These souls will then travel to Gloomfield, to fully free them you must search for them using Zero’s Eyeglass. Upon finding them you must just walk into them and they will disappear. Once all are gone, they will drop a coin drop that can be found in front of the manor. Step 6.) Taking the drop will mean you cannot hold any weapons. The undead will freeze and you will be able to take the coin and insert it into a ticket booth at Safe Haven. Doing this will give you the ticket found in the loading screen and will spawn parts to the Nightmare Mechanism. Step 8.) Now, with the parts acquired they must build the Nightmare Mechanism. Upon building, they will be able to place the three idols onto pedestals which will power it. Step 9.) All players must interact with the Nightmare Mechanism, they will be thrust back in time, much like when they travel from Gloomfield to Redemption without use of the vessel. Step 10.) Take the coin to the teddy bear on the X-Dark Vessel and get it blessed by the souls of the lost. Step 11.) Whilst being in the past, you will find everything is black and white. There are no zombies as of yet but there are actually civilians that can be found surviving in the safe haven. They are blurred out mostly. Suddenly you will hear them screaming. From the sky, a meteor will fall and start to crash into the city. This is not the only meteor, by going to the map room you will find they are actually crashing all across the Earth, including on to past maps, hence them being identified on the map. The blurred out faces begin to glow with red eyes, they will begin to attack you but be as powerful as zombies on a special round. You must then escape onto the X-Dark Vessel, upon getting on the undead will not attack you and you will keep all perks and Pack-a-Punch. Upon the meteor shower starting, you will obtain all perks and cannot lose them when going down or bleeding out, the ability to take upgraded weapons from the box and walls while also being able to have an infinite fire sale. Step 12.) Once you have gotten to the ship, you will be safe from the rest of the map. A new direction on the X-Dark Vessel will be unlocked that has a yellow button. To use this you must insert the ticket which will then light the yellow button and make the ship move. By going here you will end the game, but by not going you will be brought forward into time and be able to progress as normal. Activating the yellow button will bring players to somewhere covered in clouds. The vessel will then start to shake and a large hole will have been made in the side of the ship. In the distance, a serpent shape flies upwards and disappears in front of the sun. You begin to crash, unable to do anything to save yourself…. Game Over, until next time. In the Ancients Chamber, you will be able to shoot a 115 meteor rock which will reveal a note in the wall. This note says: “Ntf sluol juh ijcl mqu zn usbitbm bed ntf jhuppns qumc bufiv ih fiv bfapu oz ybe” Under it is a sticky note attached with the word Vigenere. Located in the X-Dark Vessel “Everything ends tonight… The liars will burn and history will be mine to control… Uniform, Mike, Bravo, Romeo, Alpha.”- A voice sounding like a quieter version of Demonic Samantha from the first Origins Intro Cutscene. The last voice is the one stating numbers in Verruckt and Shino Numa. These are made by my friend the Arisen, I love his music and I asked him if he could make something that fit the tone of my map. So far, from what I have heard it really does and I can't wait to add more of his music. Safe Haven by NVOL: ? Challenge Accepted 5G: In Dystopia, activate all three challenges. Problem Solution 5G: In Dystopia, kill 30 zombies in under 10 seconds with a new Wunder Weapon. Survival Instinct 5G: In Dystopia, kill every type of enemy in one game. Miscellaneous 10G: In Dystopia, buy a new beverage. Discovery 10G: In Dystopia, discover a long forgotten secret. In Grave Danger 10G: In Dystopia, find the means to survive for the third time. The Vindicator 15G: In Dystopia, redeem yourself. Long way from Home 15G: In Dystopia, travel to a new place. Rise of the Ancients 75G: In Dystopia, learn the truth. Dystopian Meteor Shower 100G: In Dystopia, watch the end of creation. Okay, so this is obviously my map idea, as it is very long (30 pages on a Google Document) I would not be opposed to some stuff being put into spoilers, I am not very good with them, but my one condition is that the colours of the writing, say for example in weapons needs to be the same as the colours of text are the colours of actual things in map. Thanks for any help that anyone does in regards to editing, I know its a hard thing to do and it is greatly appreciated. Nice! And 30 pages long!? Dear lord!! Thanks and yes, I went overboard with it and had a lot of stuff to establish with it so it had to be long! Just added one of the Music Easter Eggs, its made by my friend who goes on here named @The Arisen, I really like the song as it essentially puts the Gloom in Gloomfield. Peter's track really does fit in. I'm impressed. Good Job! Yeah it really does and I can't wait for his other stuff. Also I am going to see fit he can do music for other projects too. Thanks Mocking. I have just added the Voyage musical Easter Egg, I really like this one I think it fits the X- Dark Vessel really well.